The first step in the adoption process is to understand that it takes some time. Reputable breeders usually have long waiting lists. 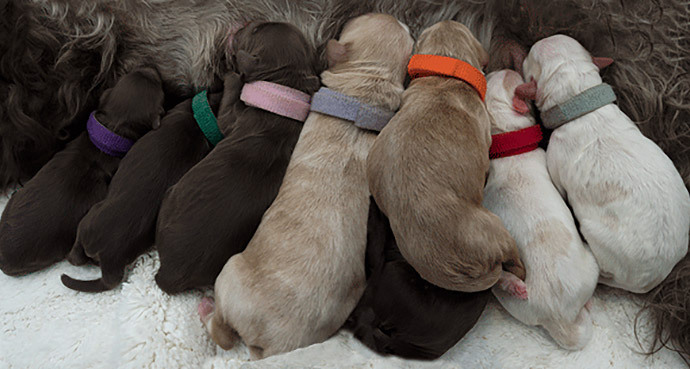 Also, there’s a strong “Mother Nature” component to breeding dogs – sometimes pregnancies are not successful; sometimes litters are much larger or smaller than expected; and the gender or colour of puppies cannot be predetermined. Temperament is the most important factor when considering which puppy will fit best with your family, although we will do our very best to meet your preferences for gender and colour. Fill in an application. Please do your best to fill in all the information because we use it to ensure the best possible match for you and your puppy. When we receive the application, please give us a day or two to respond. We keep approved applications in the order of receipt. When the puppies are about 3 weeks old we will be in touch with you directly again seeking more information about your lifestyle. At this stage of puppy development we will already be seeing differences in their personalities and we start watching for a good match for you. The balance of the purchase price ($2,650 CAD) is due when your puppy is 6 weeks old. This is the age at which we allocate the puppies to each family, based on lifestyle and the information you provided in your application and any emails or conversations between us. Your puppy will be ready to join your family when he/she is a full 8 weeks old. After allocations we start making appointments for pick up, or flight arrangements if the puppy needs to travel. Note: If circumstances prevent you from taking a puppy at that time, your name will go on the next litter reservation list of your choosing. We want the timing to be right for you. In that case, the deposit is applied to that reservation list and is non-refundable. If, for any reason, Modern Doodles cannot supply a puppy, your deposit will be refunded. We paper-train the puppies and, weather permitting, we train them to go outside through a dog-door. 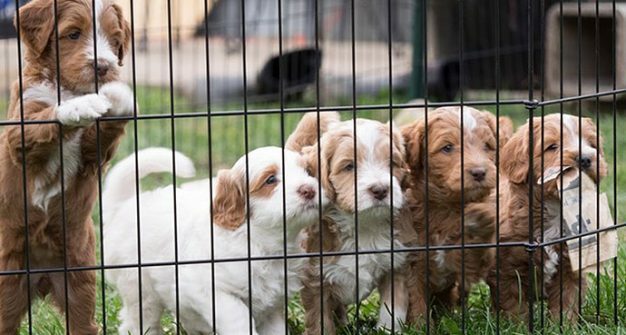 Puppies are ready to go to their new homes when they are 8 – 9 weeks old. At the time of allocation, you will be advised of the pick-up date. If you need more information, please ask questions! We want you to have the best possible experience with your puppy. Modern Doodles guarantees the health of its puppies and provides a written health guarantee: If the puppy is found by the Purchaser’s veterinarian of choice to have a previously undiagnosed medical condition within the first 7 days following pick-up or delivery and a written report by the attending veterinarian is sent to Modern Doodles by the Purchaser within 7 days following that diagnosis, the Purchaser may return the puppy for a full refund. If the Purchaser chooses to keep the puppy, Modern Doodles will pay all veterinary bills, for treatment only, up to $2,000 CAD upon receipt of invoices from Purchaser’s vet clinic. Modern Doodles additionally guarantees that the puppy will be free of severe or life threatening disease, including active hip or elbow dysplasia, for 2 years from the date of this contract. Active hip dysplasia is defined as radiographic results determined to be moderate or severe by the Orthopedic Foundation for Animals (OFA). Modern Doodles reserves the right to confirm OFA testing before a replacement/refund is made. Should a severe or life threatening condition be diagnosed at any time during this period, the Purchaser will notify Modern Doodles of the condition within 7 days of diagnosis. The Purchaser will, upon request, provide Modern Doodles with all relevant x-rays and/or reports for examination by Modern Doodles’ veterinarian. 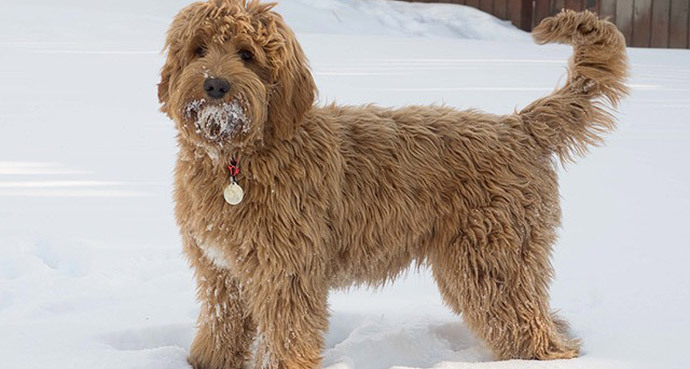 Should a disorder be confirmed by Modern Doodles’ veterinarian, Modern Doodles will accept the return of the dog and provide a replacement puppy from the next available litter, or refund half the purchase price, at Modern Doodles’ discretion. If the Purchaser wishes to keep the dog, Modern Doodles will pay vet expenses of up to $2,000 CAD upon receipt of vet clinic invoices. Modern Doodles Does Not Guarantee against any non-genetic condition, disease or injury that is caused by: inappropriate diet, excessive exercise, injury (deliberate or accidental), abuse, untimely or inappropriate veterinary care. Modern Doodles cannot guarantee the ultimate size, weight, colour, coat or disposition of any puppy. Just like a human, a dog can be subject to many ailments in the course of its life. Only some of these ailments are genetic. This health guarantee does not include maladies that are common to any living creature such as ear infections, food or environmental allergies, misaligned teeth or tooth decay, etc. We strongly advise that health insurance be purchased. If the puppy is returned for any other reason from 11 weeks to 6 months of age, Modern Doodles will refund half of the purchase price to the Purchaser. After the age of 6 months, Modern Doodles will refund at its own discretion.